Muqtada al-Sadr will maintain close relations with Iran and wants the United States to withdraw all its troops from Iraq and the Middle East, a top aide to the Iraqi cleric was quoted as saying in an interview with an Iranian outlet affiliated with the Islamic Revolution Guards Corps (IRGC). Dhiaa al-Asadi, who is also heading a pro-Sadr group in parliament, defended the latest coalition between Sadr’s Sairoon bloc with the Iranian-backed Fatah Alliance to form the next government, arguing that the coalition would help strengthen Iraq’s security and stability. “After a press conference with Hadi al-Amiri, a new coalition has taken shape. And it is possible that al-Nasr [a coalition led by Prime Minister Haider al-Abadi] also joins this coalition.” He added that the coalition remains open to include the State of Law bloc led by former Prime Minister Nouri al-Maliki, although he ruled that out in a separate interview with The National. Asked by Tasnim about Sadr’s trip to Saudi Arabia, Asadi said Sadr wants to have friendly and “balanced” relations with all regional countries so that none of Iraq’s neighbors can disproportionately influence Iraqi politics. Referring to a post-election meeting between Sadr and foreign diplomats in the holy city of Najaf, Asadi said Sadr wished Iran’s ambassador had also participated, apparently rejecting rumors that the Iranian envoy was not invited. He claimed that Sadr told the Saudi ambassador at the meeting that the Riyadh-led coalition’s war in Yemen destabilizes the region. Comment: Last week, the Sadr bloc announced that it has formed a coalition with the Fatah Alliance, which is dominated by pro-Iran units of Iraqi Popular Mobilization Forces (PMF) and is run by Badr Organization leader Hadi al-Amiri. The National Wisdom Movement, led by prominent Shiite cleric and politician Ammar al-Hakim, and al-Wataniya Alliance, headed by Vice President Ayad Allawi, are also part of the new coalition. The coalition is now close to securing a majority to form the government. Sadr’s alliance with Fatah is a victory for Iran. During the campaign season, Sadr and his allies had adopted a nationalist platform and openly criticized Iran’s acts of meddling in Iraqi affairs. 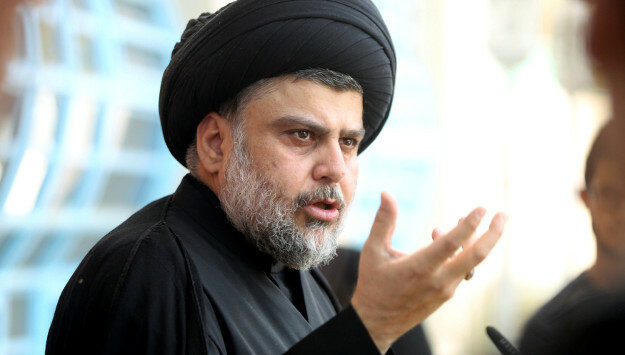 Sadr had also called for the disbandment of the PMF. But the inclusion of Fatah in the new government will allow Tehran to continue to be a major player in Iraqi security and politics, most likely at the expense of Iraqi democracy and U.S. national security interests. Sadr’s alliance with Fatah also drew criticism in Saudi Arabia and other regional Sunni states. Iran and its Iraqi allies are trying to make Maliki’s State of Law bloc part of the new coalition as well, but it remains to be seen if all sides will agree. Yesterday, Qais al-Khazali, the head of Iranian-backed Asa’ib Ahl al-Haq and key leader of Fatah, met with Maliki to discuss post-election developments. Sadr had pledged that if his coalitions wins he would end the existing patronage network and political quota system that have fueled corruption and undermined governance in Iraq. By forming a coalition with Fatah, however, he may have already compromised on that promise.